Award Winning Extra Virgin Olive Oil, Pasta, Gluten Free Pasta, Antipasti, Balsamic Vinegar & More From Italy. We are thrilled to be able to introduce our line of gluten free, which has to be tried to be believed. The pasta is completely natural made with only 3 ingredients, cornflour, rice flour and water. No additional additives means that the pasta is perfect for those following a Gluten Free Diet. Years of research and taste testing have been put into the development of this pasta which is produced using traditional techniques. Our gluten free pasta is also slow dried and bronze drawn meaning that the pasta will not breakup during cooking and the taste is exactly the same as high quality bronze drawn durum wheat pasta. So unlike other gluten free pastas there is no need to sacrifice taste and quality while following a gluten free diet. 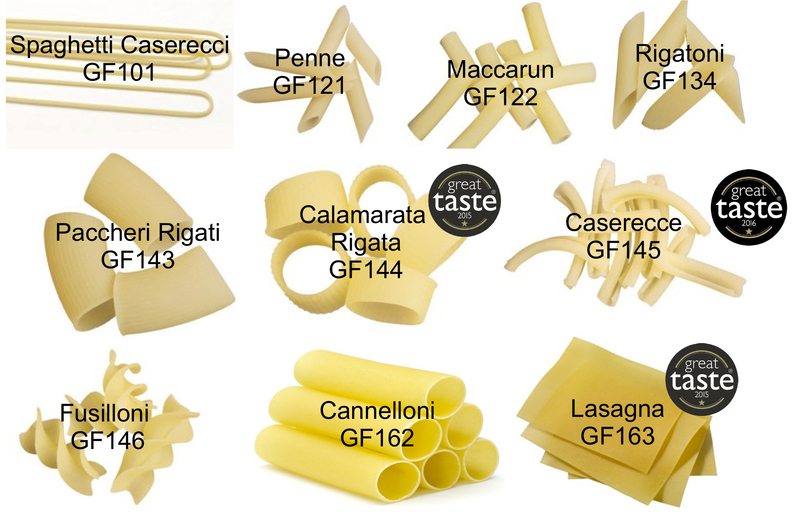 We offer 10 different shapes of pasta, including 3 Great Taste Award Winners, meaning the whole family can enjoy spaghetti, lasagna and many more. Click to view and purchase our gluten free pasta. Hi Mary, sorry for the delay in replying to you. The gluten free pasta is made with only cornflour, rice flour and water. There is nothing else added. It is an artisan pasta so is bronze drawn and slow dried and has a 24 month shelf life. If I can be of any further assistance to you then please get in touch vincent@tenutamarmorelle.com. The Corn for the Gluten Free Pasta is 100% GMO! !